Crowstone House is celebrating cultural diversity – Don’t miss out! Join us on 12 October at 2pm. 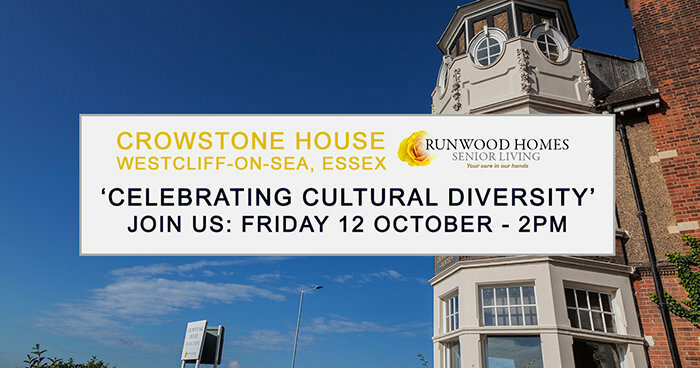 Come along and have a taste of the varied cultures and cuisines from around the world on Friday 12 October from 2pm at Crowstone House residential care home, situated in Westcliff-on-Sea, along the seafront. Our professional care and catering staff from around the world will delight you with their traditional food, music and costume. Sample delicious dishes from the Philippines, Poland, France, Mauritius, Nigeria, Australia, Germany, Spain, not forgetting England! Please come and meet our wonderful Crowstone House care home team. For more information, please call 01702 436611 or email crowstone.house@runwoodhomes.co.uk . Visit the Crowstone House web page by clicking here. We live in a society that has many different ethnic or national cultures mingling freely. We need to encourage such a coexistence, we believe that cultural practices, no matter how unusual, should be celebrated. Read more about Crowstone Hosue celebrating cultural diversities by clicking here.